Trading bitcoin is not only because it is the future of currency but also its high volatility. As a trader, volatility is the most important thing. It is 24/7 market and you can do the day trading as many as you want without any requirement. You will get more than ten times return compare with stock market or any financial market with the same analyze skill. ©2018 Bitcoin Trading Academy LLC. The Content had been prepared by Bitcoin Trading Academy LLC for general information and educational purposes only and is not (and cannot be construed or relied upon as) personal advice nor as an offer to buy/sell/subscribe to any of the financial products mentioned herein. 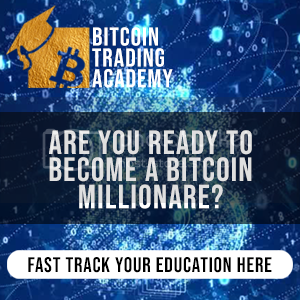 Bitcoin Trading Academy provides an online/offline Learning Centre to assist clients along the learning curve of Leveraged Products and details how leverage magnifies the risk as well as reward. Bitcoin Trading Academy also provides class room style classes, where moderators provide support, training and live market commentary. No investment objectives, financial circumstances or needs of any individual have been taken into consideration in the preparation or delivery of the Content. Financial products are complex, entail risk of loss, may rise and fall, and are impacted by a range of market and economic factors, and you should always obtain professional advice to ensure trading or investing in such products is suitable for your circumstances, and ensure you obtain, read and understand any applicable offer document.